"Diaspora Jews should not support the misguided policies of Israeli leaders and that Israel should look to North America for moral guidance." Rabbi, if this is truly what you have stated then you have helped place the security of Israel in jeopardy. Remember, Netanyahu won re-election by an overwhelming landslide. So then, it is not just "Israeli leadership" but almost all Israelis who by your definition are "misguided". We do not have a perfect government. And yes, the Ultra Orthodox may have too much power - but how dare you tell Jews in the US and in Europe not to support the Jews in Israel while they are being stabbed to death - not due to any occupation - but rather directly due to Islamic Jihad. Do you know what Jihad is? It is an unforgiving Islamic holy war against both Jews and Christians. I know. I watched the World Trade Center fall. I served in the IDF for 18 years. I have stepped over the warm bodies of Jewish victims of terror. You want Israel to turn to America for "moral guidance". What do Americans know about our internal and external security concerns in Israel? Why not go on IDF or border police patrol with me for a month in and around Jerusalem and see for yourself what we are up against? Rabbi, my son now serves proudly in the Israel Air Force. Do you now want to tell him directly to his face what you have stated to thousands of Jews in the US - to turn your backs on fellow Jews who are being attacked daily with knives, bullets and missiles? I awoke this morning to the sound of an alarm going off. It was a real time rocket attack from Gaza targeting Jews in Israel. Rabbi - why are they attacking Jews in Israel? Is it that we are "occupying" Tel Aviv, Jerusalem and Haifa or is it Islamic Jihad? Please do not lecture me and my fellow Jews who live in Israel on tikkun olam. I have served as an Humanitarian Officer at security checkpoints in Israel. We treat Israeli Arabs with care, understanding and respect. Please do not tell me how you support Israel when you dismiss our biblical land - Judea and Samaria. This land was never occupied. This holy land was returned to Israel at the end of the 1967 war. If you want to say this land is "occupied" then please show me a picture of Arafat and yourself kissing. "Occupied land" in Israel was an Arafat invention supported by millions of petro dollars. When you attack the Israeli government you attack each and every Israeli. You want us to try harder for peace. Perhaps you could travel to Rahamallah and convince Abbas to meet with Netanyahu. The Palestinian Authority has rejected every peace offer made to it. Yet you place the blame their negligence on Israel. And you say you support Israel? You know and even state that our enemies will use any and all criticism publicly made against Israel. Yet you give them ammunition. Why do you support their incitement against our very lives. Please tell me how you plan to make peace with Iran, Hamas, Hezbollah, the PA and ISIS? I'm waiting. So is my son who wears a uniform defending the Jewish people. I have had the good opportunity of attending a Reform synagogue for the past few years. I have much respect for both the Rabbi and it's kind, dedicated Jewish community. Your position on Israel does not reflect the Reform Jews who I have come to embrace. Your blatant and destructive attack against Israel, advocating for Jews to attack our government makes me sick. You want to affect change - come live in Israel. Twenty years ago I was given the task to remember. To make sure the world remembered. While producing Israel's first commercial Website, our work was diverted to create the first interactive, humanitarian Website. A Website for an Israel Prime Minister who was murdered only a few hours earlier. 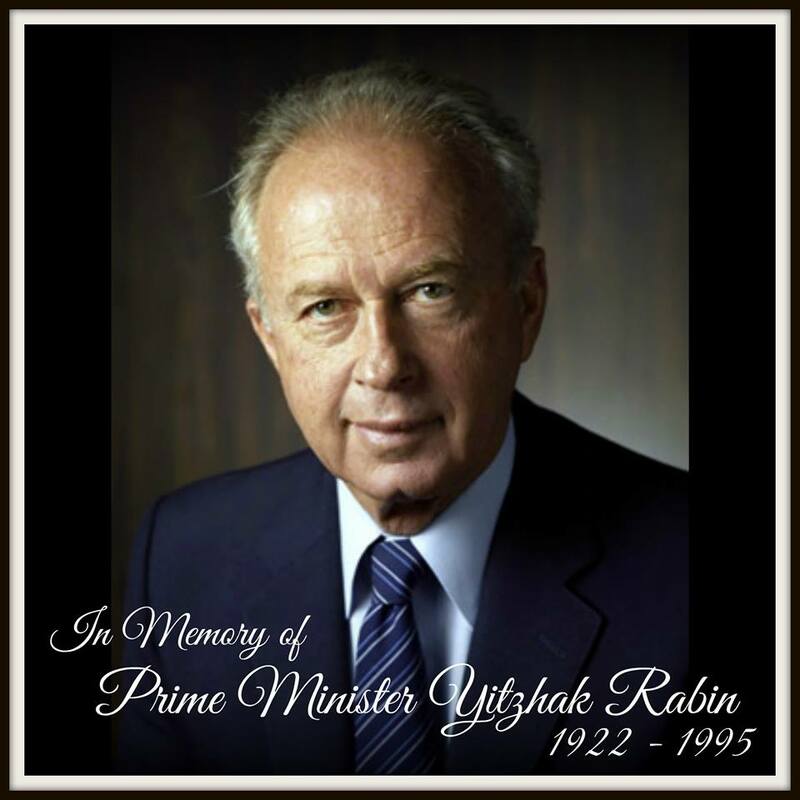 Yitzhak Rabin was an Israeli politician, statesman and general. He was the fifth Prime Minister of Israel, serving two terms in office, 1974–77 and 1992 until his assassination in 1995. Rabin was raised in a Labor Zionist household.